Just 45 seconds! This will be the time taken to complete your baggage check-in at the Kempegowda International Airport, Bengaluru. 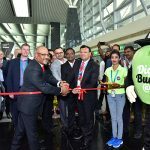 The Bangalore International Airport Limited – operator of the BLR Airport – has, once more, raised the bar for passenger experience by deploying 16 fully-automated Self-Bag-Drop machines that will significantly accelerate the baggage transaction and reduce check-in queues. Self-Bag-Drops are already in use at other Indian Airports, but BLR Airport is the first in the Country to introduce fully automated baggage drop-off systems. Designed and installed by Materna IPS, the Air.Go fully-automated self-bag-drop machines would initially be available for passengers flying with Air Asia and Spice Jet. 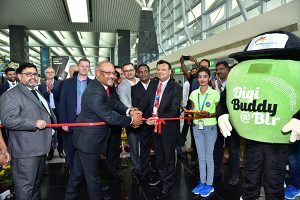 “Continuous improvement of passenger experience at the BLR Airport has always been a priority for us and the introduction of the new Self-Bag-Drop is a testimony to that. We’re excited to be the first airport in the Country to offer our passengers and airlines an unique technology that will ease the process of air travel. Our goal is to use technology to improve the passenger experience and to make airport operations more efficient,” said Javed Malik, COO, BIAL. The Self-Bag-Drop employs a two-step approach. A passenger will first print a boarding pass and an eezee-tag (bag tag) at a self check-in kiosk. Once tagged, the passenger will go to the bag drop machine, scan the boarding pass to initiate the bag drop process. The bag will be measured, weighed, scanned and automatically fed into the baggage handling system. As many as 32 brand new self check-in kiosks will be installed to print boarding pass and baggage tags. In case of an excess baggage, the passenger will be directed to a hybrid counter to complete the check-in and payment. With its new location in Bengaluru, Materna is laying the foundations for its activities in the Indian market and for providing intensive support for its customers here. Known for its user-friendliness, the Air.Go kiosks fulfills the requirements and augurs well for all airports. In cooperation with Danish designer Marcus Pederson, Materna has adapted the solution with customised design elements especially for this airport.